I learned about Ten Things of Thankful from Ellen over at 15 and Meowing, who learned about it from Messymimi’s Meanderings. It originally came from the Lizzi Lewis at Considerings and is now maintained by Josie2Shoes over at Ten Things of Thankful blog. The birds that I hear tweeting in the backyard right now. The opportunity that our daughter has this morning, even though it isn’t exactly as she had hoped for. Now being reasonably sure of our Vivaldi’s gender (female). That I will soon get to take a nap. Groceries in the house and food for the birds. Quiet time with my Bible and Heavenly Father. Pushing through fear of ‘not good enough’ and doing the thing anyway. A working car with enough gas to get by. This entry was posted in 2017, Blog Hops, Gratitude, Ten Things of Thankful. Bookmark the permalink. 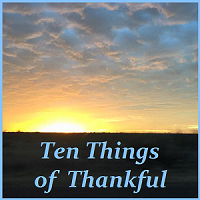 Thanks for these links – I need to remember to be thankful for all the wonderfulness around me! You’re welcome, Emily. 🙂 I think that sometimes we have to look really hard, but there’s always something to be thankful for. You live in a beautiful area with all sorts of wonderfulness around. 🙂 Have a blessed weekend. Wonderful things to be thankful for. Love the list. They are common things that are really big, sometimes, we take for granted. I’m glad you joined us in Ttot. Thank you, Carin. I hope that you have a beautiful day. I love hearing the birds, I am surprised we have as many around here as we do, considering that it is usually rather brown and dry. We are always grateful when good things happen for our children, sometimes things that aren’t exactly what we wanted can turn out to be just right for us. I love your #4, there is sometimes nothing I look forward to more than the opportunity to take a short restful nap, it feels like such a gift! I am always thankful for enough groceries in the house and enough food for the furkids. It is a blessing that I never take for granted when so many go hungry. We may not eat grandly at times, but we always have plenty to eat. That quiet time spent in reading, prayer and meditation is the very best gift you give yourself, it sets the tone for the rest of the day, week, and your life overall. So often if we don’t take time for that nothing goes right. It takes great courage to do things that we fear we can’t do well, I am proud of you for pushing past it and discovering that you are more capable than you thought so. We tend to think that everyone else can do things better than us, and the truth is that God needs our efforts too! Oh, yes, definitely thankful for vehicles in good working condition and enough gas to keep them running, life without those basic necessities is much more difficult and repairs are so costly! Antibiotics are truly lifesavers! Look how many people died from common causes such as pneumonia or infection from injury before they were readily available. I tend to wait to go to the doctor to see if my body can heal itself, but there is a point when you just know you need that help, and we are grateful it is there for us! I don’t think I’d make it through a single day were it not for compassionate, caring friends, nearly all of them being on the Internet. No matter what’s happening in my life there is someone who checks in, helps me find my perspective, and gives me hope for the days ahead. Compassion is a gift we can give away without ever running low in our supply, and it is so healing! Thank you for your response my post, Josie. Many of my friends these days are online, too. In regards to pneumonia, I am very glad for antibiotics. The flu and pneumonia pretty much wiped out my Granny Gunter’s family, starting with her daddy’s generation. His brother died during the pandemic of 1918. It is terribly sad to walk through the cemeteries and see all those graves from the pandemic, especially those for the babies. Nothing I like more than a nice afternoon nap, or whatever time it’s needed. We take antibiotics for granted I think. We use them far too liberally and what would we do without them? You have shared a great list of gratitudes. Taking time to read the Bible and feeling those impressions that come into your mind as you do so certainly strengthens one’s relationship with our Father in Heaven. Pushing through the fear is such a powerful thing, even though very difficult at times. Thank you, Pat. I think the crow cawing is nice, too, unless they sneak up behind me and do it all of a sudden haha. I am enjoying my daily devotions and often find myself doing more of the Bible reading that it lists. The devotional has the reading broken up in a way that I will have read the Bible through in one year’s time. We’ll see how that goes. I’m still working on pushing through, but it will happen.